The last 12 months have been a period of steady expansion for KQF and, from our experience, interest in Halal foods seems to be growing all the time. Halal Macon Rashers – an HMC-certified alternative to bacon. Made with chicken and beef, the Rashers are sold pre-cooked and ready-smoked and are ideal for use in sandwiches, salads and many other dishes. Launched at the start of 2015, they have proven extremely popular. 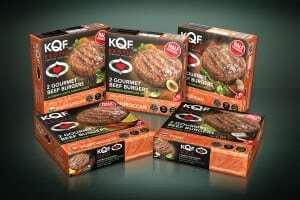 KQF Exotic range – a series of five half-pounder Halal beef burgers (220g), each featuring a different national flavour profile. Made with 90% lean beef, the burgers are an extension to the Khan Exotique range that KQF launched for the European Halal market. The flavour options include Thai, South African, Moroccan, Portuguese (Piri Piri) and Mexican. Great British range of Jumbo beef burgers – KQF has extended its range of Jumbo burgers with the addition of a simply seasoned ‘Great British’ flavour profile. Here, the focus is on high quality meat, simply seasoned without the use of herbs or spices. Weighing 110g each, these HMC-certified quarter-pounder burgers are available in beef, chicken and lamb. Since the start of 2015, KQF has been approached by a number of multiples offering trials of its products and, at a domestic level, KQF began working with SPAR – one of the world’s largest international food retail chains. Interestingly, however, organic growth in the Halal market seems to be driving up demand at all levels, even amongst small retailers and wholesalers that don’t specifically target the Muslim market. In the last six to nine months, this has been especially pronounced; we’ve seen more enquiries and greater order volumes from all businesses, regardless of whether or not they specialise in Halal products. For example, we recently established a relationship with a small independent store in the UK that sells a range of fresh foods to mainstream schools. Its customers had been asking increasingly for Halal products and by working with KQF, it is now able to offer a range of fully certified Halal foods. Likewise, we recently received an enquiry from a specialist food supplier that targets airport caterers. Previously, it had been sourcing products from Europe but Muslim travellers were increasingly asking about the provenance and certification of the foods on sale. The company was particularly interested in KQF because its products are certified by the HMC, which it regards as well trusted by Muslim consumers both in the UK and further afield. The European market is where KQF has seen some of its fastest growth this year. Last year, we really consolidated our position in France, thanks to the appointment of a specialist French distributor, AsiaFoodCo. This partnership enabled us to extend our network of retailers very substantially – introducing our products to some of the country’s largest and best known multiples. The key question at the time was how the products would be greeted by consumers and what the retailers’ repeat order volumes would be like. Happily, this year, orders have risen markedly and they continue to rise – suggesting that French consumers have confidence in our products and our accreditation by the (UK-based) Halal Monitoring Committee. We have now developed excellent relations with one of Sweden’s largest retailers and such has been the level of interest that we are even seeing enquiries from neighbouring Oslo – customers having apparently bought our products in Sweden and then taken them home, across the border to Norway. Scandinavia therefore seems to be becoming another important growth market. Interestingly, we have done this purely in response to natural organic demand, rather than as a result of any concerted marketing campaign. In Germany, KQF has been developing an alliance with a specialist in sausage manufacture. As a result of its technical input and unrivalled expertise in the development of flavour profiles, we have launched a new range of German-inspired ready-cooked sausages. Like all our products, we manufacture our Halal Hot Dog sausages in the UK, and they are certified Halal by the HMC. In addition, and again the result of collaboration with specialists in Germany, we are launching a pre-cooked Halal Pepperoni and a new Turkish-inspired Doner Range. The Doners – thin, spicy, ready-cooked slices of lamb or chicken – are HMC certified and will initially be sold in the UK. In addition to investing in new product development, we’ve also made a strong commitment to expanding our factory and improving both its capacity and efficiency. The layout of the production, cooking and storage areas has recently been improved. The work has enabled us to increase production and make use of efficient new machinery. We recently underwent our annual audit for accreditation by the British Retail Consortium and were recommended for a Grade A rating for another full year. (KQF has been BRC-accredited since 2013.) In addition, the auditor complimented recent works around our High Risk facility and the overall condition of our factory. For more details, please contact Faruk Vali.